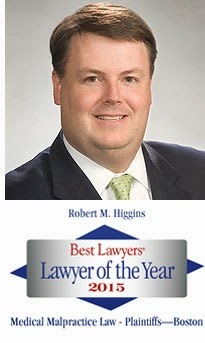 We are pleased to announce that Robert M. Higgins has been selected by Best Lawyers® as Boston's "Lawyer of the Year" - Medical Malpractice Law for 2015. Higgins, a partner of the firm, has achieved numerous mulit-million verdicts and settlements on behalf of his clients. Best Lawyers compiles its lists of outstanding attorneys by conducting exhaustive peer-review surveys in which thousands of leading lawyers confidentially evaluate their professional peers. The current, 20th edition of Best Lawyers® (2015) is based on more than 5.5 million votes by other lawyers. The lawyers being honored as “Lawyers of the Year” have received particularly high ratings in surveys by earning a high level of respect among their peers for their abilities, professionalism, and integrity.